West Ham's hopes of qualifying for the Champions League were dented as they could only draw with Crystal Palace. 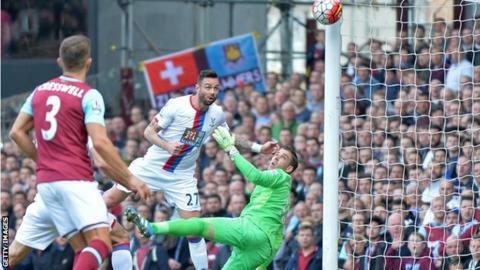 The Eagles went in front when Damien Delaney headed into the net from close range after a mistake from Adrian. But the Hammers equalised three minutes later through Manuel Lanzini's low effort before Dimitri Payet's stunning 20-yard free-kick put the hosts ahead. West Ham's Cheikhou Kouyate was sent off for fouling Dwight Gayle, who equalised after Angelo Ogbonna's error. West Ham have never played in the Champions League and are now three points behind fourth-placed Manchester City. But Slaven Bilic and his side will be furious with the decision from referee Mark Clattenburg in the 67th minute. The Hammers were 2-1 ahead when Clattenburg dismissed Kouyate after he clumsily lunged at Gayle. Contact was made, but a straight red card seemed an extremely harsh decision. Speaking after the match, Gayle admitted he did not think Kouyate's challenge was "too bad", but it had a big impact on the match. Palace, who instantly brought on striker Fraizer Campbell for midfielder Joe Ledley after Kouyate's sending off, equalised eight minutes later when Gayle pounced as Ogbonna made a mess of an attempted clearance. It was an afternoon of great entertainment at Upton Park. Before Kouyate's sending off, West Ham had looked well-placed to claim the three points. Despite falling behind in the 15th minute, they were only in arrears for three minutes before Diafra Sakho headed down Michail Antonio's cross and Lanzini drilled his low effort home. But the moment of the match, once again, came from the boot of midfielder Payet, whose curling, dipping 20-yard free-kick put the Hammers ahead as half-time approached. It was his 12th goal of the season and he has also been directly involved in 23 goals in all competitions, 13 more than any other West Ham player. If the Hammers do miss out on Champions League qualification then they will face a battle to keep hold of the France midfielder, who is surely going to be among the contenders for the Premier League's Player of the Year award. Although they earned a good point, Crystal Palace may well see this as a missed opportunity. They were gifted a fortunate opener when Adrian parried Bakary Sako's free-kick, even though the ball was heading out, into Delaney's path, who headed in from close range. Even when they were pegged back, the Eagles should have retaken the lead when Jason Puncheon found himself free six yards out. But he did not know whether to head or volley the ball and did neither, with the ball bouncing off his knee and over the bar. Alan Pardew's side have now not won in 14 Premier League games, but will be encouraged by the number of chances they created. The Eagles, who have reached the semi-finals of the FA Cup, are 16th, seven points above Sunderland in 18th. However, with a home game against Norwich and a trip to struggling Newcastle among their remaining fixtures, Pardew will be confident his side will stay in the top flight. Crystal Palace have scored the most goals by defenders in the Premier League this season (nine). Only Southampton (six) have been shown more red cards than West Ham United (five) in the league this season. Dwight Gayle ended a run of 20 Premier League games without a goal, scoring for the first time since January 2015. Crystal Palace remain the only team in the top four tiers who are yet to win a game in 2016 (drawn two, lost nine). West Ham manager Slaven Bilic said: "I want to commend the players it was a good game of football, open, and we deserved to win. "When it was 11 v 11 the scoreline was correct. They caused us a threat, but only at set pieces, then we turned it around." On the decision to send off Kouyate, Bilic added: "I would love to say a lot of things. I asked the legal people what can I say and what I can't. It is never a red card and it's the fourth game in a row we are getting decisions that are costing us. "We're fighting to finish high. If the opponent is better than you, ok, but it is frustrating. We aren't going to sink or moan - we will come back and continue to play good football." Crystal Palace boss Alan Pardew admitted that he did not agree with Mark Clattenburg's decision to send off Kouyate. "I thought the red card was harsh and I would've been disappointed to have that happen to one of my players," said Pardew. "When you are 2-1 down at West Ham, in the form they are in, you take a 2-2. I'm delighted for the team and they showed their heart is still very much in it. We've got ourselves into a bit of trouble but this is a great result. "Every point in the Premier League is gold-dust, especially to get something at West Ham. It was a great performance and a great result. West Ham had to defend for their lives at the end." Next weekend is a vital one for West Ham and their hopes of qualifying for the Champions League as they entertain an Arsenal side third in the table. That London derby is the early kick-off on Saturday, 9 April, the same day as Crystal Palace's 3pm home game against Norwich City, another team fighting to stay in the Premier League. Match ends, West Ham United 2, Crystal Palace 2. Second Half ends, West Ham United 2, Crystal Palace 2. Bakary Sako (Crystal Palace) is shown the yellow card for a bad foul. Enner Valencia (West Ham United) wins a free kick in the defensive half. Foul by Bakary Sako (Crystal Palace). Foul by Andy Carroll (West Ham United). Mile Jedinak (Crystal Palace) wins a free kick in the defensive half. Attempt missed. Scott Dann (Crystal Palace) right footed shot from the right side of the box is high and wide to the right following a corner. Attempt blocked. Jason Puncheon (Crystal Palace) left footed shot from outside the box is blocked. Corner, Crystal Palace. Conceded by Pedro Obiang. Joel Ward (Crystal Palace) is shown the yellow card for a bad foul. Angelo Ogbonna (West Ham United) wins a free kick on the left wing. Joel Ward (Crystal Palace) wins a free kick in the defensive half. Attempt blocked. Andy Carroll (West Ham United) left footed shot from outside the box is blocked. Assisted by Manuel Lanzini. Offside, Crystal Palace. Yannick Bolasie tries a through ball, but Fraizer Campbell is caught offside. Hand ball by Dwight Gayle (Crystal Palace). Attempt blocked. Bakary Sako (Crystal Palace) left footed shot from the centre of the box is blocked. Assisted by Yannick Bolasie with a cross. Foul by Damien Delaney (Crystal Palace). Attempt blocked. Manuel Lanzini (West Ham United) left footed shot from outside the box is blocked. Assisted by Michail Antonio. Attempt missed. Winston Reid (West Ham United) right footed shot from the left side of the box misses to the right following a corner. Attempt missed. Andy Carroll (West Ham United) left footed shot from the right side of the box misses to the left. Assisted by Dimitri Payet with a cross following a corner. Attempt blocked. Enner Valencia (West Ham United) right footed shot from the centre of the box is blocked. Assisted by Manuel Lanzini. Corner, West Ham United. Conceded by Pape Souaré. Andy Carroll (West Ham United) wins a free kick in the defensive half. Foul by Jason Puncheon (Crystal Palace). Dimitri Payet (West Ham United) wins a free kick in the attacking half. Angelo Ogbonna (West Ham United) wins a free kick in the defensive half. Substitution, West Ham United. Pedro Obiang replaces Mark Noble. Foul by Enner Valencia (West Ham United). Manuel Lanzini (West Ham United) wins a free kick in the attacking half. Foul by Mile Jedinak (Crystal Palace). Offside, Crystal Palace. Scott Dann tries a through ball, but Fraizer Campbell is caught offside. Goal! West Ham United 2, Crystal Palace 2. Dwight Gayle (Crystal Palace) right footed shot from the centre of the box to the centre of the goal.